«The third version of Neighbourhood: Where Alvaro meets Aldo presents a new display by COR arquitectos (with Nuno Grande) inside the building of the Faculty of Architecture of Porto, designed by Álvaro Siza in the early 90’s of the last century. Here, the meeting between Álvaro (Siza) and Aldo (Rossi) is symbolically represented by the blue colour invading the immaculate space of the exhibition hall. 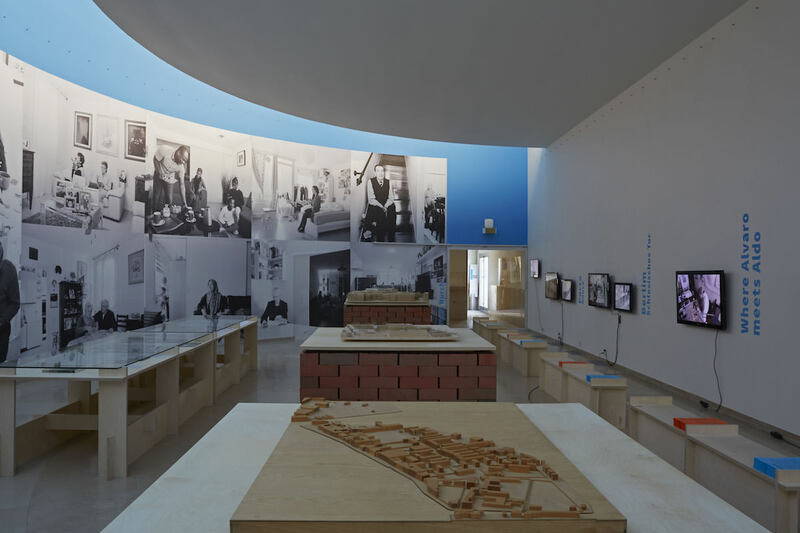 On the curved wall, there are large-format photographs with the “neighbours” of the four neighbourhoods of Siza (Venice, The Hague, Berlin and Porto). On the straight wall, there are videos of the trips to those neighbourhoods. In the display cases, the relationship between Álvaro and Aldo, other trips, is told. Four brick pillars support the models of those neighbourhoods in these four cities».